The State of Qatar got a new ruler today after the abdication of Sheikh Hamad bin Khalifa Al-Thani, b. 1950, who had been in power since 1995. His younger son Sheikh Tamim Bin Hamad Al-Thani, b. 1980, who was named heir after his brother Sheikh Jassem stepped aside in 2003, has become the new Emir. I have therefore updated my Longest reigns (current monarchs) website. Some work has also be done on the website in order to make among others the footnotes more readable. Sheikh Tamim, b. 3 July 1980 according to the website of the Qatari Ministry of Foreign Affairs, is the youngest monarch of the world today, closely followed by the King of Bhutan, Jigme Khesar Namgyal Wangchuk, who was born on 21 February 1980. In March 2011 I wrote an article about a visit I made to the Old Garrison Cemetery in Poznan, Poland. During my visit to the cemetery I found the grave of Halldor Espelid (1920-1944), who was one of 76 captured airmen who escaped from the Stalag Luft III camp in Żagań, Poland through a tunnel. Espelid and a fellow Norwegian, Nils Jørgen Fuglesang, came as far as to Flensburg near the Danish boarder before they were recaptured and soon after executed. Today, 15 June 2013, the Norwegian newspaper Dagbladet brings the story of Halldor Espelid's escape and execution. The front page gives the headline "Nå vet hun hvordan broren ble drept. 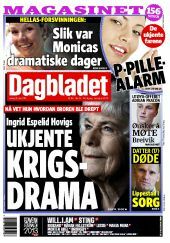 Ingerid Espelid Hovigs ukjente krigsdrama" ("Now she knows how her brother was killed. Ingerid Espelid Hovig's unknown war drama"). On the pages 14 and 15 we are told that "Broren myrdet av Gestapo" ("Her brother was murdered by the Gestapo") and "- Jeg kommer aldri til å glemme broren min" ("- I will never forget my brother"). Hovig is a famous and beloved Norwegian TV chef and cook books author. The journalists who have written the article, Asbjørn Svarstad, who is based in Berlin (and who gave a helping hand when I tried to locate Erica Bernadotte's grave in 2011), and Line Brustad, could have done better research. Throughout the article Halldor's name is spelt Hallada (probably a mistake from the book). Twice it is also stated that "H. Espelid" was buried at Wroclaw, when in fact the Old Garrison Cemetery is situated in Poznan. Now, it could be that Mrs. Hovig, who has just celebrated her 89th birthday, mixed the two cities together when talking to one of the journalists. But shouldn't the journalists have double-checked the information before publishing? Well, at least I think so. Hovig says in the interview that she learned about the location of her brother's grave as late as in 1988, and thereby confirmed the contents of the weekly magazine article I vaguely remembered having read before visiting the cemetery. In my blog article about the royal wedding in Stockholm last Saturday, I wondered about - or pondered on - the guest named Herbert Hoover and his possible family connection to the 31st president. I have not come any closer to an answer yet, though. I have asked the office of the Herbert Hoover National Historic Site in Iowa, but as the wedding guest is a private person, the office is of course under no requirement to answer. And the wedding guest doesn't have to be related even if he bears the president's name. But all the pondering has made me more curious about the president, so today I ordered the Kindle version of Glen Jeansonne's biography The Life of Herbert Hoover. Fighting Quaker 1928-1933 (Palgrave Macmillan, 2012). 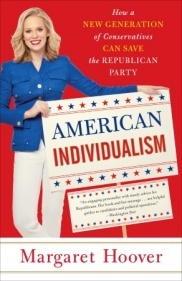 The biography is according to its preface the fifth in a series of volumes about President Hoover sponsored by the Herbert Hoover Presidential Library Association. The three first volumes, written by George H. Nash, gives the story of Hoover's life to 1918, while the fourth volume, written by Kendrick Clements, continues until 1928. As the title suggests, Jeansonne's biography covers the election and the presidency, 1928-1933. 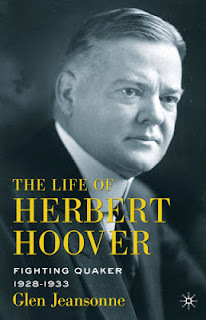 If I want to read a biography which covers the whole life of the president, I could for instance order William E. Leuchtenburg's biography on Hoover (Times Books, 2009, in the American Presidents series). Or I could limit myself to the chapters about the president in Hans Olav Lahlum's Presidentene. Fra George Washington til George W. Bush (Oslo: Cappelen Damm, 2008), Ole O. Moen's USAs presidenter. Fra George Washington til George W. Bush (Oslo: Historie & Kultur, 2008) or perhaps Carter Smith's Presidents. All you need to know (Hylas Publishing, revised edition, 2005). The latter is a bit too short, though.The full title of the book is actually - or seems to be - Presidents. Every question answered. Everything you could possibly want to know about the Nation's Chief Executives. Brian Lamb's Who's Buried in Grant's Tomb. A Tour of Presidential Gravesites (New York: Public Affairs, 2003) might provide a better alternative. It is one of the most entertaining books I own - and have read. I am of course open to suggestions about other books which cover President Hoover. Best biography I have read about a US president so far? David McCullough on John Adams and Kenneth D. Ackerman's Dark Horse. The Surprise Election and Political Murder of President James A. Garfield (New York: Carroll & Graf Publishers, 2003) definately share the first prize. Herbert Clark Hoover (1874-1964), 31st President of the USA --> Allan Hoover (1907-1993) --> Andrew Hoover (1940-) --> Margaret Hoover (1977). 4 new royal stamps will be issued by the Norwegian Postal Service on Monday 10 June 2013 to mark the 40th birthdays of Crown Prince Haakon and Crown Princess Mette-Marit on 20 July and 19 August respectively. 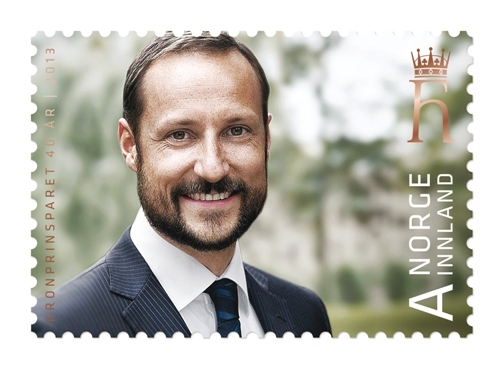 The two first stamps show the Crown Prince and Crown Princess with their monograms. 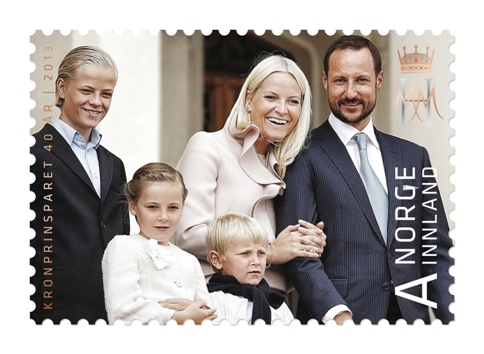 The third stamp shows the Crown Princely family at Skaugum - Marius Borg Høiby, Crown Princess Mette-Marit, Crown Prince Haakon and in front Princess Ingrid Alexandra and Prince Sverre Magnus. 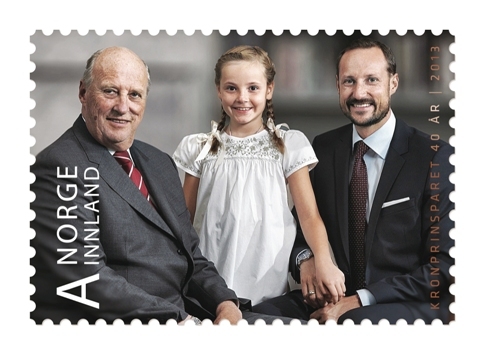 The fourth and last stamp pictures King Harald V and the two first persons in the line of succession to the Norwegian throne. 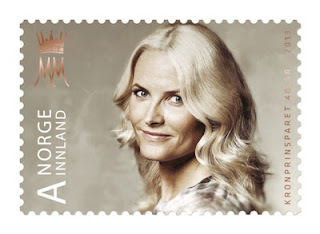 The stamps are designed by the well-known stamp artist Enzo Finger. 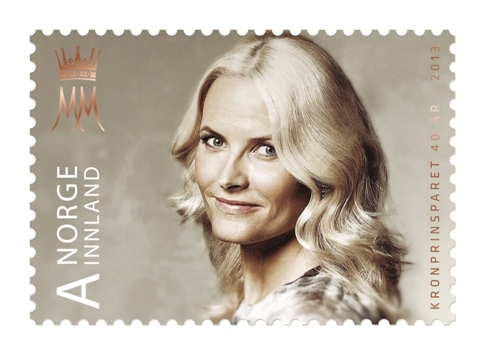 All the stamps are valued at NOK 9,50 (A-mail, domestic). The various products made in connection with the new release can be viewed here. © The Swedish Royal Court (Photo: Ewa-Marie Rundquist). Princess Madeleine of Sweden, youngest child and daughter of King Carl XVI Gustaf and Queen Silvia, and Christopher O'Neill, son of the late Paul O'Neill and Eva Maria O'Neill, née Walter, were married in the Palace Church in Stockholm today, 8 June 2013. I only managed to watch "the basics" of the ceremony, but would describe it as "solemn and nice", but of course less ceremonious than Crown Princess Victoria and Prince Daniel's wedding in 2010. The couple seemed to be marked by the gravity of the occasion, but their love and affection for eachother shined through. As I hadn't expected to see much of the ceremony, I had not read myself up on the event in advance, and was therefore surprised by little Princess Estelle's presence in the church. She seemed to enjoy herself most of the time, but got a bit bored in the end. The choice of music for the ceremony is of course a matter of taste. I would personally have preferred more traditional hymns rather than the songs performed by Marie Fredriksson (of Roxette fame) and Peter Jöback. I really enjoyed the Bridal Recession (Wedding March from Delsbo). The program of the ceremony can be viewed here. For the record, the officiating clergy at the wedding were Chief Court Chaplain of the Royal Court and Bishop Emeritus Lars-Göran Lönnermark and Vicar of the Royal Court, Court Chaplain Michael Bjerkhagen. Mr. Christopher O'Neill's best man was Mr. Cedric Notz. He is according to the court a childhood friend of Austrian and Swiss descent and resides in Switzerland. The bridal attendants at the wedding were Lillie von Horn, twin sisters Annais and Chloe Sommerlath, Count Louis Countess and Chiara Abensperg und Traun, and Jasper D'Abo. Princess Madeleine's wedding dress was created by the Italian designer Valentino Garavani (and that is as far as I will get into that). The wedding celebrations begain on Friday 7 June with a private dinner for invited guests at Grand Hôtel, Stockholm. Following the wedding ceremony and the cortège, a wedding banquet (which goes on as I write) took place at Drottningholm Palace. More details about the wedding can be read here. Several bloggers and royalty board participants have commented on the guest list already, and I have not that much to add. Interesting to note, howver, that Prince Carl Philip's girl-friend/live-in-partner, Sofia Hellqvist, in the Palace Church was sitting in the "family section". Many commentators regard this as yet another sign that she is fully accepted and that an engagement is not too far away. I have, for the record, posted the guest list as published by the Royal Court, although with a few adjustments. For instance, as I find it a bit strange that Prince Pierre and Princess Silvia of Arenberg (d'Arenberg) were presented just only as "TT.SS.HH. Prince och Princess d'Arenberg", considering the numbers of princes and princesses of that house. But maybe that is just me. I am also intrigued by the presence of a Mr. Herbert Hoover, probably a friend of Chris O'Neill. How is he related to Herbert Hoover (1874-1964), President of the USA 1929-1933? I consulted the Hoover Genealogy at the website of the Herbert Hoover National Historic Site Iowa, but didn't get a clue. The genealogy is not updated, though. I found an obituary of the president's grandson Herbert Hoover III (1927-2010), but as far as I can tell he had no son named Herbert Hoover IV. Anyone out there with more details? If anyone wonders why Crown Princess Mette-Marit of Norway was absent from the gala dinner on Friday, it was because she was on her way home from a Red Cross engagement in Burma (Myanmar). She arrived in Stockholm early on Saturday morning. Updated on Saturday 8 June 2013 at 22:55 (photo added). © The Swedish Royal Court (Photo: Kate Gabor). In connection with the celebration of the National Day of Sweden - «Svenska Flaggans Dag» (The Swedish Flag Day) - the Swedish Royal Court released a rather lovely photo of Princess Estelle (b. 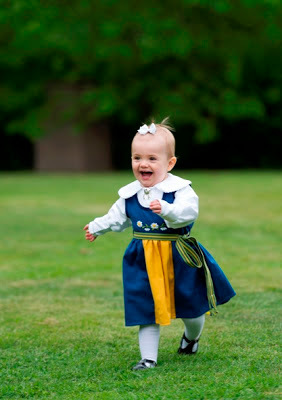 23 February 2012), the daughter of Crown Princess Victoria and Prince Daniel. The Swedish Royal Family took part in the celebrations at Skansen and held a reception at the Royal Palace in Stockholm. The Swedish National Day is celebrated in memory of Gustav Vasa, who was elected King of Sweden on 6 June 1523. 6 June is also the day when Sweden promulgated a new Constitution (Instrument of Government) in 1809. In two days Princess Madeleine, the youngest child and daughter of King Carl XVI Gustaf and Queen Silvia will marry Chris O'Neill in the Palace Church in Stockholm. For more information see the Royal Court's own wedding website.